For anyone that loves stories that just draw you in from the beginning, you will love this book. Not only do you get a book that allows your imagination to soar, but you get to dream about the world of the comic book that comes to life in this story. I ended up reading this with my eldest and at he end she stated that this was "Awesome". High praise for a nine year old! 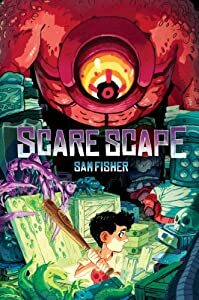 One of the things that I loved about the book was not only the characters and the plot, but I loved the "Monster Deck" section of the book where you get to meet some of the monsters from Scare Scape. These monsters are well drawn out and you can tell that you would not particularly want to meet up with these creatures outside the pages of a book! All-in-all, this book was a fun read that all will enjoy - so get ready to read and imagine!